Generally, I'm not a fan of pancakes. Most kinds I've had turn into a pile of mushy goo within seconds of adding syrup. My father-in-law makes sourdough pancakes that my whole family loves--it requires keeping a start and mixing up the night before. Too much commitment on my part. 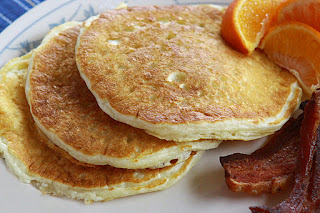 This recipe is very close in taste and texture to the sourdough pancakes. It calls for 1 cup buttermilk, so I buy a quart and it lasts in the fridge for a month or so for Saturday breakfasts. All other ingredients are always on hand. This recipe makes approx 12 pancakes. Easy to double or triple. Add ingredients into a bowl in the order given and wisk together. Let mixture sit for a few minutes while you heat up your pan or griddle. Using a 1/4 measuring cup, scoop batter and pour onto hot griddle. When pancakes are bubbled on top, it's time to flip.